A liability is a debt, obligation or responsibility by an individual or company. Current liabilities are debts that are due within 12 months or the yearly portion of a long term debt. Accounts payable - This is money owed to suppliers. Accrued expenses - These are monies due to a third party but not yet payable; for example, wages payable. Accrued Interest - This includes all interest that has accrued since last paid. Bank account overdrafts - These are short term advances made by the bank for overdrafts. Bank loans or notes payable -This is the current principal portion of along-term note. Current maturities of long-term debt - This is the part of a long term debt that is due in the upcoming 12 months. Customer deposits or unearned revenue - These are payments given by customers as an advance for future work that is expected to be completed by the end of the next 12 months. Dividends payable - These are the dividents declared by the company Board of Directors that have not yet been paid to the shareholders. Income taxes payable - These are taxes owed to the government that have not yet been paid. Interest payable - This is interest owed to lenders that has not been paid. Notes payable (other than bank notes) - This is the current principal portion of long-term notes. Payroll taxes payable - This is taxes withheld from employees or taxes related to employee compensation. Rental payments - These are paid for renting buildings, land, pastures, or other property or structures. Short-term notes payable - These loans are due upon demand or within the next year. Sales taxes payable - These are taxes collected from customers for the government that need to be paid to the government. Wages - These are owed to employees. These different examples of current liabilities for companies and for individuals show the breadth of liability which could be the obligation of a company or individual. "Examples of Current Liabilities." YourDictionary, n.d. Web. 23 April 2019. 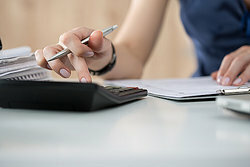 <https://examples.yourdictionary.com/examples-of-current-liabilities.html>.